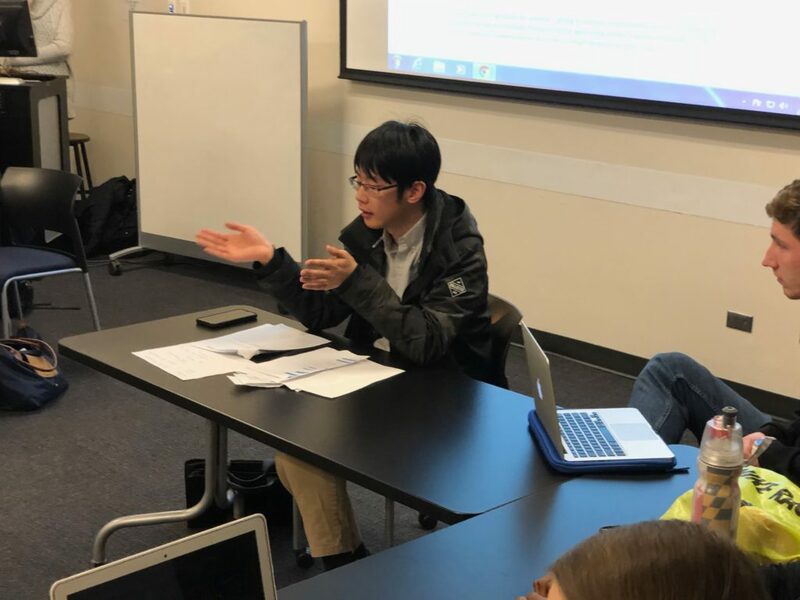 Student Government Association (SGA) legislators voted unanimously on Monday night to advance impeachment procedures against SGA President Dwight Ma (17Ox, 19C). The legislators will decide whether to remove Ma, who has about a month left in office, in a closed-door session next week. Ma will need the support of at least one-third of legislators to avoid impeachment. SGA Vice President of Communications Tiffany Haas (19C) submitted a Feb. 3 letter to SGA calling for Ma’s impeachment. “I believe that Dwight Ma has repeatedly violated our school’s conduct code, has exhibited gross unethical behavior, abuse of power and overall exceptional misconduct of the office he holds, all of which are impeachable offenses under the rules of the legislature,” Haas said at the meeting. Haas requested the legislature conduct a private hearing next week to examine evidence, including screenshots of her text messages with Ma, which she says demonstrated “intimidation and abuse of power,” Haas said. Ma denied threatening Haas. He wanted to distribute copies of their messages at the meeting, which he believes would clear up the miscommunication, but Speaker of the Legislature and Sophomore Representative Lori Steffel (21B) stopped him. Steffel said sharing the chat history in a public legislative session without Haas’ permission would be a violation of privacy laws. “This is going to be public evidence … you have to have consent of the opposite party. I think that that’s just law, like above the SGA,” Steffel said. After the meeting, Steffel wrote in a Feb. 12 email to the Wheel that she disallowed Ma from distributing the evidence because the presentation of evidence is only permitted in an impeachment hearing. “More than that, those text messages may very likely emotionally harm other students if made public due to their content, which violates our Undergraduate Student Code of Conduct,” she wrote. Ma tore printed versions of his message exchange with Haas, handing them to Sophomore Representative Zion Kidd (21C). Haas left the room in tears and was absent for the remainder of the meeting. Ma also provided the Wheel with a copy of the messages that he and Haas exchanged in October 2018 and January 2019. In October, Ma confronted Haas about her speaking to the Wheel for an article about creating executive agencies for black and international student groups without informing him first. Ma said he believes Haas misinterpreted one particular message he sent: “If you continue speak something that I am not aware or I’m not informed, it will be a problem.” Ma clarified that he meant it would have been a problem to the entire SGA, and not to Haas personally. “If I cannot communicate with my VP of Communications, there will not only be a problem for me but for SGA,” he said at the meeting Monday night. In another discussion on Jan. 1, Ma and Haas discussed the draft of a letter Ma wanted to send to the student community. The two argued about when the message should be sent, and Haas said she would establish a procedure that would require her permission before Ma could send school-wide emails. Eventually, Haas said, “please email me if you have questions or I will report you for harassing me.” Ma said he wasn’t harassing anyone but Haas said she didn’t want to talk to him anymore and wanted SGA’s adviser CC’d on all future communications. The two didn’t communicate further via Facebook Messenger. Valid reasons for impeachment include “gross violations of the Student Constitution or bylaws of the SGA, failure to perform the duty of one’s office, study abroad, violation of the applicable school’s Honor or Conduct Codes, gross unethical behavior [and] abuse of power,” according to the Rules and Procedures of SGA. “We need to be able to see all the evidence to be able to see what actually happened,” Singhal said. Junior Representative Johnson Wang (20C) was not present at the meeting but sent a text message in support of Ma that was read by his proxy. All 11 legislators who were present unanimously voted to advance impeachment proceedings. In an interview after the meeting, Ma said he was “sad” to be disallowed from sharing the chat history because he believed that by reading the messages he could absolve himself of the accusations. At SGA’s Feb. 4 meeting, Lindsay Gorby (19C) and RHA President Aaron Jordan (20C) called on the legislature to impeach Ma because he fired Chief of Staff Ben Palmer (18Ox, 20C), Vice President of Finance Paul Park (17Ox, 19B) and Elections Board Chair Justin Cohen (20C). The legislature voted 7-3 against a formal hearing at that meeting. SGA’s closed-door impeachment hearing will be on Feb. 18, according to an email from Steffel to student government leaders. The weekly legislative session is canceled, Steffel wrote. Executive Vice President John Priddy (19C) would become president if Ma is impeached at next week’s meeting. The Finance Committee has proposed a bill to amend the SGA Finance Code that would increase the Student Activity Fee (SAF) from $92 to $103.50 and peg future increases to yearly tuition changes. According to the current Finance Code, the SAF would have increased to about $95 because a 3 percent Cost of Living Adjustment (COLA) is permitted once every four years. SGA informed the undergraduate student body via email about this proposed change before the meeting on Monday as it is an issue of significance. The bill was supposed to appear as a first reading on Monday, but legislators tabled it for the following week in light of the impeachment inquiry hearing. SGA approved March 20 to 22 as Spring 2019 election dates. Former Elections Board Chair Justin Cohen (20C) had announced before he was fired that the elections would be held before spring break. The legislature also considered holding elections from March 27 to 29. Eight legislators voted for the earlier option and four preferred the later option. Legislators hoped that by holding elections earlier, newly elected members would have more time to transition into their roles before the summer and appoint executive board members. Correction (2/13/19 at 10:20 a.m.): A previous version of this article stated that Ma and Haas disputed an article about creating a new VP of finance position. In fact, they disputed an article about creating executive agencies for international and black student clubs.